What are the Innovations to Come in 3D Printing? The coming years are probably going to be the most exciting for 3D printing innovations. Indeed, the cost of 3D printing technologies will continue to drop while new expiring patents in industrial printing processes will enable engineers and researchers to create cheaper, more efficient and more innovative services. The first 3D printing patent was actually filed by Charles Hull in 1984: he invented stereolithography, known as SLA, i.e. Stereolithography Apparatus (this name was only given in 1986). This technology was designed to print models, prototypes and patterns, by using photopolymerization thanks to UV laser. A beam of ultraviolet light is focused onto liquid photopolymer, and, when the beam moves under computer control, each layer solidifies and takes progressively the shape of the printed object. The process builds the object layer by layer starting with the bottom layer. 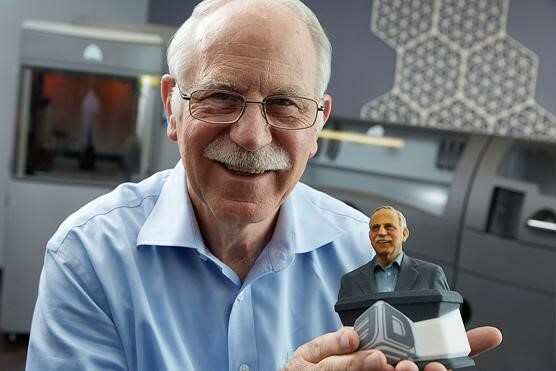 Charles Hull founded his company 3D Systems in 1986 and filed the patent for the first industrial 3D printer the same year. He also realized that his concept was not limited to liquids and finally gave it a general name, “Apparatus for the production of three-dimensional objects by stereolithography”. In 1989, the FDM (Fused Deposition Modelling) patent followed, filed by Scott Crump. Crump invented a new process that extrudes small strings of material through a printer nozzle. Once the material is melted, it is placed precisely and hardens instantly, so another layer of material can be printed on. The powder-based printing process, known as Selective Laser Sintering or SLS, was developed and patented by Carl Deckard and Joe Beaman at the University of Texas, Austin. The SLS technique is similar to SLA since it also uses a laser to shape a material, layer by layer, into a desirable object, but SLS printers use a powder material instead of a liquid one. Thus, each time the laser passes, the powder is sintered or fused on top of each previous layer to create the final object. What happened when the patents fell into the public domain ? Engineers began to create cheaper and smaller machines, easier to access and to store for more modest companies. This also inducted the increasing creation of online 3D printing services, like ourselves, created in 2009. Finally, engineers improved the patents and designed faster and better quality of machines. Competition between firms also speed up the race to a better functioning machine. This is what happened for FDM printers. When the patent fell into public domain in 2009, it created a new world for the 3D printing technology: companies like RepRap and Makerbot began to design consumer-friendly machines. They were smaller, easy to use and way cheaper! Indeed, due to the patent expiry, the price of 3D printing FDM process dropped from over $10,000 to less than $1,000. Finally, new services emerged, making it possible for smaller industries that couldn’t buy an expensive machine to access online 3D printing services. By printing on-demand their prototypes or objects, they can now receive their creation within a week and easily iterate. New materials emerged not only for prototyping but also to create finished products. What will the next innovations in additive manufacturing be? The next generation is making its way from R&D services in specialized firms to more accessible services for smaller industries, just like FDM did in 2009. SLA and SLS haven’t been explored as much as FDM, and haven’t received as much media attention, but they are on their way. SLA printers are now pioneered by the company Carbon. Inspired by Hull’s stereolithography, Carbon invented one of the fastest 3D printing processes, called Continuous Liquid Interface Production (CLIP). It is available at Sculpteo, and, if you want to know more about this technology and the various resins associated with it, you can take a look at our dedicated page. We were as well one of the first companies to experience CLIP resin and their extraordinary range of possibilities. These resins enable to prototype a wide range of products (from load-resistant mechanical parts to seals and flexible containers) at very high resolution, as well as producing commercial quality parts. These materials have been designed to respond to key engineering requirements, from the elongation and strength expected of injection-molded elastomers to the temperature resistance of a nylon-glass composite. The company just launched its new M1 3D printer. Released in april 2016, it enables to “3D print isotropic parts with mechanical properties and surface finish like injection-molded plastics” according to Carbon website. And after releasing Rigid Polyurethane (RPU), the next CLIP material to go out of our Pilot Program is the expected Elastomeric Polyurethane CLIP Resin (EPU). It is now available on our website, since november 2016, and you can now choose it, directly from the list of materials! You can learn more about this new material on our page about EPU. Another huge company in the game of liquid-based 3D printing is Formlabs. They pioneered an accessible SLA 3D printer, Form 2, in september 2015, after launching Form 1 in 2012 and Form 1+ in 2014. SLA printers’ main advantage is the higher resolution objects they can make, compared to FDM printers. SLA is now more and more affordable, and promises to be one of the most interesting techniques in terms of printing precision. However, SLA printers are still very expensive ($4,000 for Formlabs’ printer compare to $1,000 for a FDM printer). Therefore many companies prefer to resort to online 3D printing services. Big companies such as Disney have now adopted SLA technology to print their prototypes or objects. 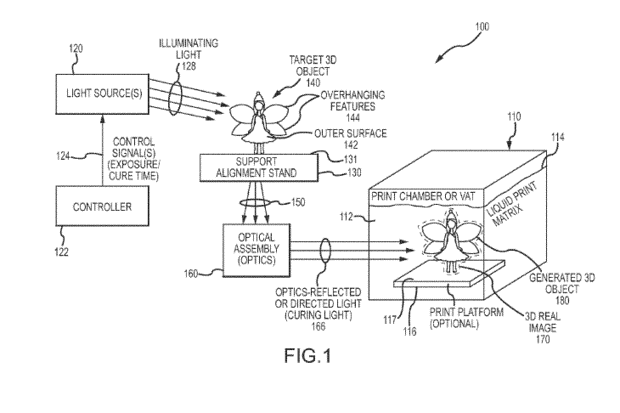 Disney Research has filed a patent in 2016 for printing in “a nearly instantaneous manner” similar to SLA 3D printing. Called “3D Printing by Volumetric Addition Through Selective Curing of a Fluid Matrix”, this technique uses high-intensity light to harden photosensitive resin in a single process. No need for layer-by-layer printing: the whole object is projected into the center of the resin, creating the model in one shot. Similar to stereolithography, this process is described as a “high speed 3D copying machine”. It uses two or more high-intensity light beams to harden photosensitive resin. The main difference with SLA is that the printer would not harden resin by drawing the outline of an object layer-by-layer. This printer uses resins that solidifies with invisible wavelengths, less affected by ambient light. It would also need to both absorb and transmit light at the curing wavelength. A significant advantage: once printed and finished, the object would just have to be lifted. In conventional 3D printing, if the object has any overhanging components, the printer has to print supports that hold these components up, adding time and material-cost to the process. SLS patents have been public for only two years but new printers are already easier to access. In September 2015, the magazine “3D Printing Industry” was getting excited about Euromold, the world’s biggest show for industrial machines. Set in Düsseldorf in 2015, Euromold was the perfect occasion for the Swiss company Sintratec to introduce their first SLS kits, presented as a fully assembled SLS 3D printer. After a successful crowdfunding campaign, it was finally launched on the market and available for purchase, for € 4,999, in october 2016. The Polish startup Sinterit designed the Lisa 3D printer based on the same technology. It was also presented at Euromold. In September 2015, it was launched at a price of $8,000, but the company offered a special price of $5,000 to the first five customers. The Italian company Sharebot announced its “SnowWhite” in october 2015, announced at a special price of €17,500, for their beta tester program. In France, Prodways, in partnership with the Chinese company Farsoon, created their SLS machines for industrial uses in november 2015 and is since working on a low-cost SLS system. The price has not been announced yet. However, as you can notice, machines are still expensive which explains why SLS 3D printing services are not as widespread as FDM ones. We can expect more improvements both in terms of prices and technology since, now that the patent is public, engineers will work on their own printers, making them faster and easier to use. 3D printing of metal is finally happening! Metal 3D printing technologies, like Selective Laser Melting (SLM) and Direct Metal Laser Sintering (DMLS), are already used to design custom metal parts for race cars, planes, or spaceships. And if their use is common now in the industry, the cost of the machines is still huge for anyone who is not a multinational company. The good news is the foundation patent for selective laser melting, filed by Fraunhofer Institute for Laser Technology, will expire in a month or so (December 2016). We still have no idea of how this could affect the 3D printing industry but we can expect that it will have an impact just as strong as the publicity of FDM and SLA patents. 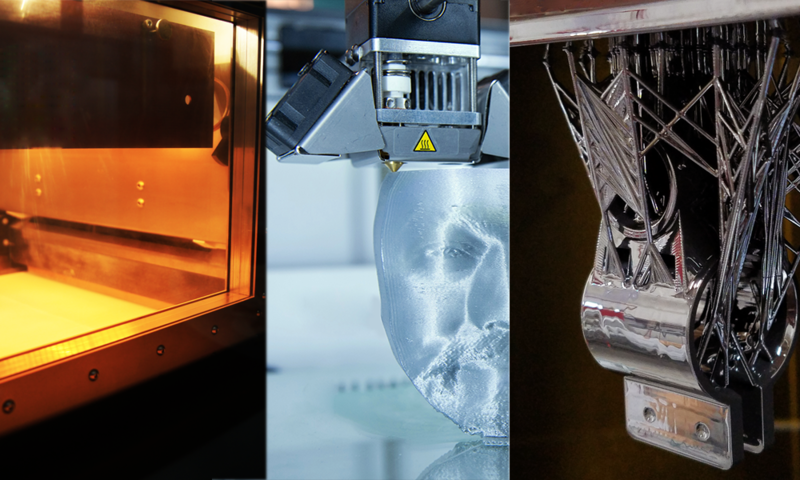 We can expect amazing growth for printing processes of functional parts in metal! Anything will be able to be printed, even complex pieces or extremely small ones, gaining such both time and money. In terms of materials as well, a whole new world opens as well! In June 2016, amorphous alloys have been successfully printed for the first time by the companies Heraeus and Exmet. Amorphous alloys are solid metallic materials, usually alloys, with a disordered atomic-scale structure. And they are know to be perfect electrical conductors, virtually unaffected by corrosion, and extremely strong. Their weight is much lighter but these metals are difficult to manufacture. That’s why they are not frequently used. But printing them would be a game-changing event! 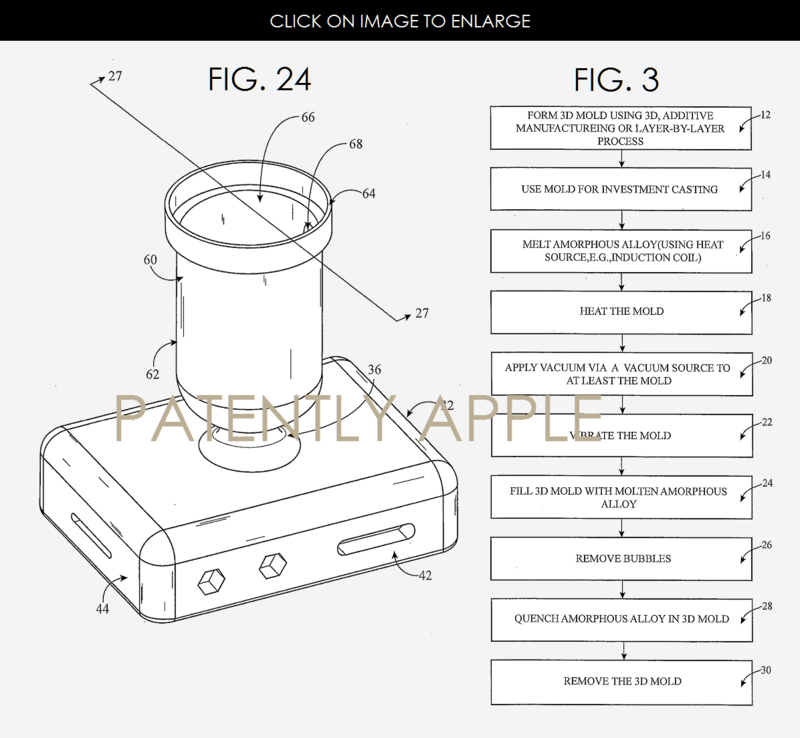 In march 2016, Apple invented its own liquid amorphous metal-based 3D printer to design its prototypes. The technique is using a 3D investment mold, printed layer by layer to form a bulk metallic glass on cooling. The mold is then filled with an amorphous alloy that will in the end form a shell to host an electronic device. Only the time and cost to produce a single part is required and many iterations can be made rapidly. We also wanted to present you some of the most ambitious patents we found. They were filed a few months ago, so you should find matter of reflexion for the next twenty years to come! In 2014, Optomec was awarded a new patent : “Miniature Aerosol Jet and Aerosol Jet Array”, smaller, lighter and at a lower cost than preceding generations. Aerosol Jet printing is a 3D printing technique that reduces the size of electronic systems by utilizing aerodynamic focusing to precisely deposit nanomaterials. It is mainly used to design fine feature circuitry and embedded components without the use of masks or patterns. Creating architectural foams: Masdar Institute of Science and Technology in Abu Dhabi filed a 3D printing patent for a new method for 3D printing ultra-strong ‘architectured foam’. They can be made from a variety of metals, plastics and composite materials and have the potential to make machines used in aerospace, medical, and automotive industries far lighter and stronger. Printing in space: Boeing has patented a process for 3D printing objects while floating in space in February 2016. Using multiple 3D printers and diamagnetic printing materials, the system would be able to rotate a levitating print about every axis and deposit layers from all directions. Their amazing video is worth watching! Materials are another issue to solve as 3D printing technique improves. As now, 3D printers mainly use polluting materials like plastics and metals. What’s at stake now is also printing eco-friendly materials. But it might happen sooner than you think! Russian PhDs Anuar Kulmagambetov and Vladimir Bodyakin are on the verge of filing a patent of a setup that can 3D print durable walls and structures from glass, using a compact glass melting furnace as an extrusion unit. 2017 should be an exciting year for new 3D printing innovations. The price of SLA and SLS printers should continue to drop while the machines will be smaller, cleaner, more efficient, industries to access cheaper 3D printing services. A major advantage of these two techniques is the level of detail they provide and the better technical properties they offer. 3D printed objects look more precise, well-crafted and refined. They can print finished objects ready to be commercialized. Metal-based technology printers should follow, even if there are still some technological constraints to overcome.